Sony Corporation announced today that it has succeed in developing Pregius S, a stacked CMOS image sensor technology that employs Sony’s proprietary global shutter function with back-illuminated pixel structure to deliver both distortion-free, high imaging performance and miniaturization. The new sensor technology is intended for industrial equipment used in fields such as manufacturing, inspection, and logistics that require higher precision and higher processing speeds, in light of the trends in industrial advancement including factory smartification and automation. In response to this, Sony has developed a proprietary pixel structure that achieves the global shutter function on a back-illuminated structure that has superior sensitivity characteristics, thereby resolving the issue of miniaturization. 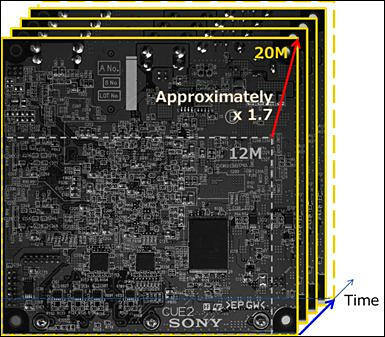 Normally, when pixels are miniaturized, the sensitivity and saturation characteristics deteriorate, but the new Sony technology enables a reduction in pixel size to 2.74 μm while maintaining performance of those characteristic, thereby achieving about 1.7 times higher resolution than conventional front-illuminated CMOS image sensors.1 This makes it possible to measure and inspect objects in a wider area and with higher accuracy in manufacturing, inspection, logistics and other applications. Moreover, thanks to the high degree of freedom of the wiring layout of back-illuminated pixel structures, a high speed of about 2.4 times that of conventional1 can be achieved, thereby contributing to significant productivity improvement, including shorter measurement and inspection process times. In addition, the sensor’s stacked structure makes it possible to mount various signal processing circuits, whereby it is possible to realize smart functions such as signal processing only for the necessary part of the measurement and inspection images in a smaller size compared to conventional sensors. *1 That, in turn, makes it possible to reduce the load of the subsequent processing and reduce the amount of data to be held on to, thereby contributing to the realization of highly efficient, energy-saving systems. Sony developed a proprietary pixel structure that achieves a global shutter function on a back-illuminated structure that has superior sensitivity characteristics, delivering both high imaging performance and miniaturization. By miniaturizing the pixel size from the conventional 3.45 μm to 2.74 μm while maintaining sensitivity and saturation characteristics, Sony has achieved about 1.7 times higher resolution than the conventional front-illuminated 12 megapixels CMOS image sensor, thereby making it possible to perform measurement and inspection in a wider area and at a higher accuracy. Moreover, thanks to the high degree of freedom of the wiring layout of the back-illuminated pixel structure, it is possible to deliver high-speed performance of about 2.4 times that of the conventional technology, thereby contributing to significant productivity improvement such as shorter measurement and inspection process times.